A deluge of email apps are trying to rein in the chaos that can overwhelm one’s inbox. Mailbox stands out from the pack, as it’s been one of the most elegant solutions on iOS, with a unique take on swiping away and snoozing emails to reach that ever elusive Inbox Zero. 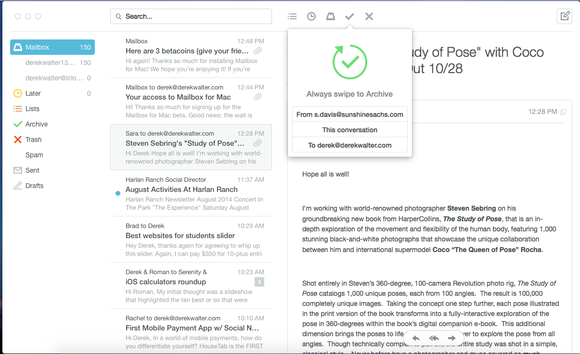 Parent company Dropbox is bringing that philosophy to OS X with the launch of the public beta of Mailbox for Mac, first announced back in April. 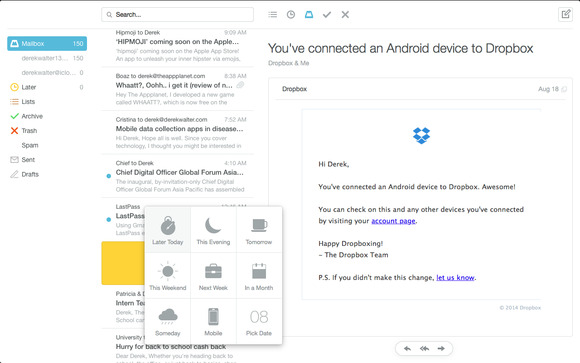 To date the app has been in a closed beta and, along with now reaching a broader audience, Dropbox has also released an updated version, adding new features. A cornerstone feature of this most recent release is support for drafts, which was absent in earlier beta versions of the Mac app. But though drafts will sync between multiple Macs running Mailbox for OS X, the feature is currently said to be “coming soon” on iOS and Android. When live it will make it a far smoother experience to connect message writing across devices. So, given the surfeit of available email clients, what makes Mailbox so compelling? One powerful feature is a behavior-tracking tool called Auto-Swipe, which builds on the app’s benchmark capacity of swiping away emails to snooze, archive, delete, or add them to a custom list. Auto-Swipe learns your behavior over time and eventually begins automatically performing that action to messages it believes fits the pattern. Train Mailbox to perform specific behaviors with the new patterns feature. For example, if you consistently archive messages from a certain sender, Mailbox will start to do so when those messages arrive. But, just in case that action isn’t what you wanted for a specific email, Mailbox will send you a notification to let you know what it’s doing. Similarly, you can train Mailbox with specific patterns. By holding on the list, snooze, archive, or delete icons when viewing a conversation you can direct Mailbox to always perform a certain action on messages from particular senders. The app’s hotkeys also let you power through messages, allowing you to launch a new email, show the archive, or take you to a specific list. Mailbox even has a clever trick for helping you learn these shortcuts: By pressing the command key, the interface displays numbers and letters corresponding to a specific action. For example, hitting Command-2 will take take you to messages that have been snoozed for later and Command-L will open up the lists. The Mailbox compose menu darkens the background so you can focus on writing your email. Further customization is available through snoozing features: You can choose when to begin and end notification of new messages, even establishing when your week and weekends start, so you don’t get bothered by work emails when you’re not on the clock. Also, when snoozing an email for “Later Today” or “Someday” you can decide when exactly those times are. “Later Today” can be as soon as one hour or 24 hours away, while the vaguer “Someday” label can delay messages for up to 12 months. Despite Mailbox’s attractions, it’s not without its limitations: Currently, it only supports Gmail and iCloud. Dropbox says that it will be adding support for other platforms in the future, but has not specified any kind of timeline for doing so. Also unclear is which mail platforms it would support, through Microsoft Exchange, IMAP, and custom domains would probably be welcome additions. Swipe to the left and select a custom list for organizing messages. Another alternative is that Dropbox could also roll out email on its own server: Beta invitations are delivered from an address ending in mailboxapp.com. However, Dropbox has announced no plans to venture into this area. 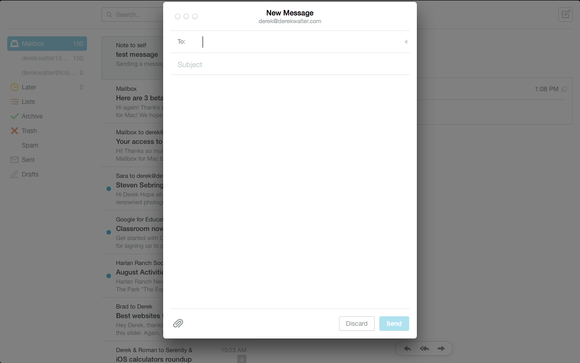 Like the iOS version, Mailbox for Mac maintains a minimalist look, with plenty of white space and clean fonts. 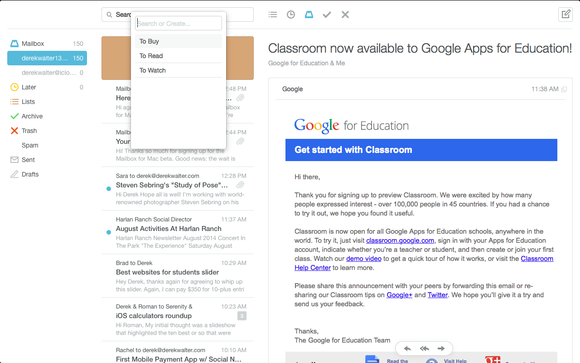 It supports full-screen display on OS X so you can focus in on taking care of your mail, without external distractions. To get the beta for yourself, head to the Mailbox site and enter your email address into the “Request a betacoin” box. You can still download the application, but you won’t be able to activate it until your betacoin arrives via email; as with Mailbox’s initial iOS launch, the app is gradually being rolled out to interested users. Once you do get an elusive betacoin, just drag it into the virtual cartoon can that’s displayed when Mailbox for Mac launches. Input your Dropbox credentials and then start swiping and snoozing emails until there aren’t any left.